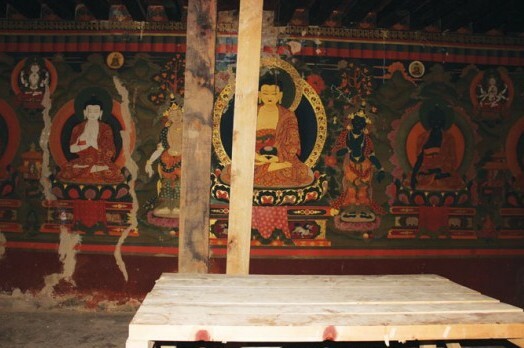 Thimphu: Bhutan:Heritage: Experts from the United Kingdom said that the rare and precious mural painting on the walls of Tango monastery could be saved without much disturbance to the structure. David Michelmore, director of a consultancy for conservation and development, based in the UK, and professor David Park, director of the wall painting conservation department of the Courtauld Institute in the UK, and the officials from department of culture visited the monastery yesterday and made presentations at Taj Tashi Hotel. The experts said that the rare and precious murals on the walls of the monastery could be saved, but more investigation was required. The monastery contains some of the most beautiful and artistically rare mural paintings in the country. But most of the paintings, done in medicinal gold, are on walls that have cracked over the years. David Michelmore is the structural engineering expert from the Courtauld Institute in London, who carried out a study to save the monastery’s mural paintings recently,recommended. He said that, looking at the walls of the monastery, it did not seem like the cracks developed because of lateral movement of the walls due to earthquake, as was widely believed. “We’ll be able to come up with some solutions to the murals and cracked walls by the end of this week,” said David Michelmore. The more the reconstruction work is done on structures like Tango, the more damage will be done to it, added David Park. “It’s not just the paintings we should be saving but the whole structure.” He said that, when it comes to saving the cultural heritage sites, it need not necessarily be “superficial renovation”. Professor David Park said that the paintings in Bhutan are of truly international significance. They are, in fact, the few original 17th century works of art remaining in the world today. “A vast amount of these finest paintings in Bhutan are damaged in the process of structural renovation and repainting,” he said. Professor Park said that the 13th century paintings on the walls of Changangkha lhakhang’s goenkhang were destroyed when the lhakhang was renovated in 1990’s. 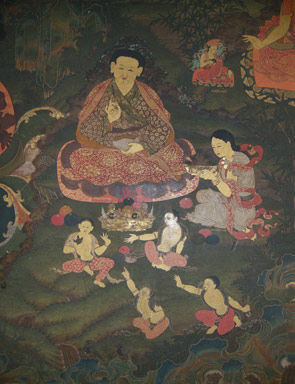 Some of the finest paintings that have remained, professor Park said, can be seen on the walls of Trongsa dzong. “The paintings there are so original that such works of art don’t exist in the whole of Asia.” He said that the wall paintings in Semtokha dzong were also spoilt when “experts from India in 1980’s repainted over the original murals”. Repainting during renovations, he said, was terribly done. “It’ll be interesting to uncover these original wall arts, but it’s not possible considering the damage it will cause,” Professor Park said.